Carey (center) with “The Trippers” as a young Wyo camper. The first time I camped out, I was nine years old and snuggled into a musty-smelling, dark green tent with five other girls. We were tired from a day spent learning canoe strokes, collecting firewood, and cooking our own food, but despite our fatigue, we couldn’t help giggling and whispering together as we drifted off to sleep. 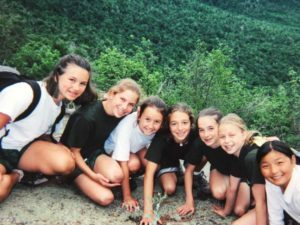 By the end of our cabin overnight on Loon Island, my love of the outdoors had been cemented: the magic of being outside with other girls had taken ahold of me. 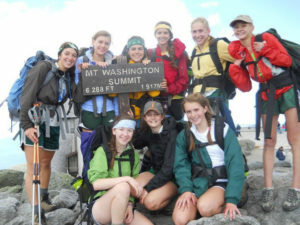 Throughout my eleven years at Wyonegonic, backpacking and canoeing trips became a central part of camp. I found that trips took everything I loved about camp and magnified the experience– in particular, the speed, depth, and quality of friendships formed with campers and counselors. Meagan Hawes and Jane Barnard, both there on my first cabin overnight as a junior camper, quickly become my comrades on outdoor adventures. By intermediate camp, our habit of signing up for every single trip had earned us the nickname, “The Trippers” (a nickname that still sticks with us when we gather for reunions with other camp friends). As a Tripper, I went on trip after trip, learning lesson after lesson. On Loon Island, I learned how good it feels to cook your own food and set up your own tent. On the St. Croix River, I learned the heart-swelling joy of being in a beautiful, remote place. On the Saco River, I observed overcrowding and disrespect of a wild space, and felt the first sparks of my environmental conscious ignite. On Mt. Washington, I learned that sometimes the best and hardest thing you can do is to turn around without reaching a summit. In the Mahoosuc Notch, I learned that laughter can get you through any hard situation (and often the best stories arise from “Type II Fun”). In Baxter State Park, I saw in my trip-leaders the type of leader I hoped to become. I emerged from my summers at Wyonegonic not only with a love of outdoor trips, but also with self-confidence, creativity as a problem-solver, an ability to stay calm in challenging situations, and an understanding of how to connect with others. Carey (rear) in a skimo competition (photo Katie Cassetta). The Wyonegonic spirit stays alive in my life today as I constantly seek to engage in outdoor experiences with other women. 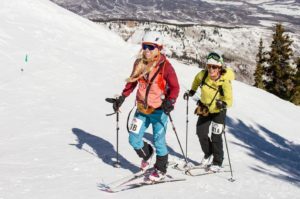 In an effort to help more girls and women to feel at home in the outdoors, this winter I am racing the Grand Traverse— a forty mile, ski mountaineering race in Colorado– as a charity team. My race partner, Sammy Podhurst, and I are raising money for a non-profit called the Wilder Women Project, which seeks to inspire and connect women through adventure, spirituality, and outdoor recreation. Empowering women in the outdoors is an important mission to both Sammy and me. We were recently featured on a recent Topophilia podcast about Wild Work. As female professionals in industries that have traditionally been, and continue to be, male dominated– Sammy as a mountain guide with Aspen Expeditions, and I as an Aspen Mountain Ski Patroller— we will have an opportunity to put our passions into action during the Elk Mountain Grand Traverse, as we take on one of the most grueling ski mountaineering races in the world as a female team. The 40-mile skimo race begins at midnight on March 29th in Crested Butte. Racers– who compete in teams for safety reasons– trek up and over the mountains, finishing at the base of Aspen Mountain 7 to 17 hours later, depending on fitness. I will call upon my Wyo experiences and memories to get me through when the going gets tough. I’ll think about traversing the Katahdin Knife Edge and channel Smack’s cool-headedness; I’ll remember summiting Mt. Jefferson and know that accomplishments feel better if you overcome a challenge; and, I’ve got a song or two I can sing along the way to remind myself of the intrepid camp spirit. My summers at Wyonegonic gave me a love of the outdoors, and made me attuned to that special magic that comes from an all-female outdoor adventure– that same magic I felt as a little nine-year-old in a smelly, green tent.